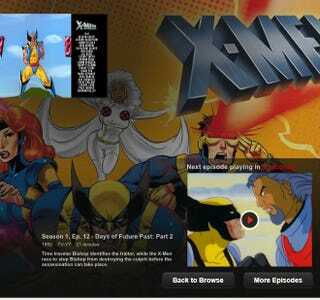 So I'm currently putting a dent in SisterJugglertheEldeest's Netflix to watch the old X-Men cartoon. I've already seen most of season 1 but I'm rewatching it for...Stuff. I don't know. I'm currently on Days for Future Past: Part 2 and these are some of my thoughts so far. I'm not alone in the "Really dislike/hate Jean Grey" camp, right? She's really annoying. This is going to be one of those things that people show their kids one day so that they can have a taste of the 90s, right? Like John Hughes movies and the A View To A Kill video. Completely awesome but a good time capsules and dated. I love Rogue's accent. It just works with how flirty she is. I love Gambit. Can I have one? It's official. Patrick Stewart and Ian McKellan are my Xavier and Magneto despite how much I love (and drool over) McAvoy and Fassbender. I'm sorry, boys. Wolverine has blue hair! What is up with that?! I don't know why but this is a good show to marathon because I can't stop clicking "Next Episode". I will keep you all posted on my other findings later.